Hello everyone! We’re at Marina Bay Sands in Singapore, where yesterday Geely revealed its new electric vehicle brand, Geometry. With that comes the world premiere of the car formerly known as the Geely GE11, now simply called the Geometry A.
Firstly, a little bit about Geometry itself, which will now be the home of Geely’s mainstream electric vehicles – think of it as being to Geely what Polestar is to Volvo – with conventional, hybrid and plug-in hybrid models continuing to be sold under the main Geely Auto brand. The name is meant to signify the core values of the brand, which are “multi-dimensional”, “focused” and “pure”. It will wear a sleeker silver version of Geely’s logo and will initially be available in first- and second-tier cities in China, with exclusively-developed platforms, distribution channels and products. The company plans to launch 10 new models by 2025, including sedans, SUVs and MPVs. Singapore was picked as the city to debut the brand because of its status as a technology hub and an eco-friendly city, and as a meeting point between East and West, said the company. There’s no specific timeframe for the market launch in the city state, despite the country being earmarked as one of the first four export markets – the others being Argentina, Norway and France – with 18,000 orders in these countries so far. With that out of the way, let’s talk about the Geometry A, which we’ve already seen in previously-released images. 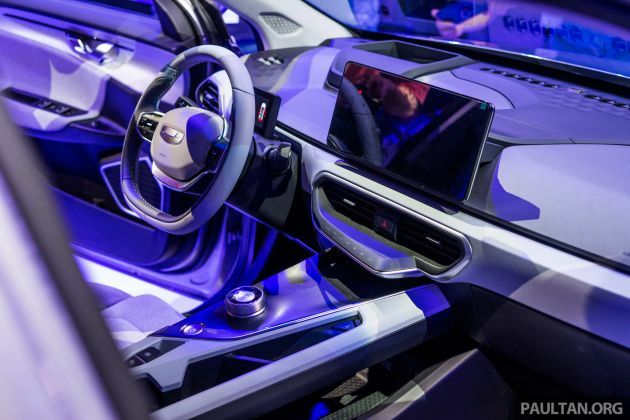 The company claims that the car has been styled to highlight its status as a zero-emissions vehicle, based around a new concept for full-electric vehicles that is “multi-dimensional, fluid and alive” – despite the car still wearing Geely’s “expanding cosmos” design identity. Without a conventional grille, the concentric ring design has now spread across the entire front fascia, a cue lifted from the Concept Icon. The slim headlights are said to expand laterally like “blades of light,” with tails that reach around the sides of the car. 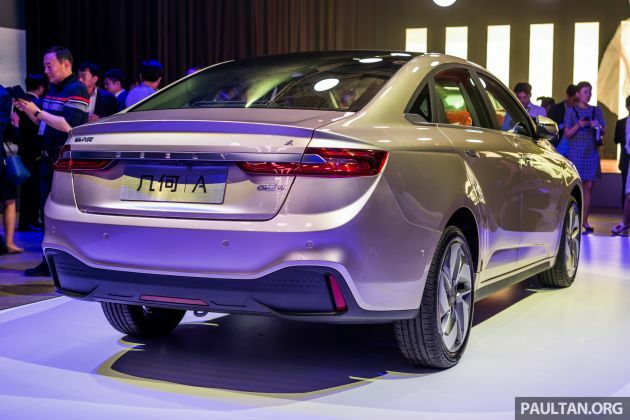 Here, instead of the pronounced front fenders of other Geely models, there’s just a straight upper shoulder line, with another line rising up from the rear fenders. There’s also a panoramic roof that continues the sweep of the front windscreen, as well as flush door handles that pop out when the user approaches. The C-shaped tail lights are clean and crisp, linked by a strip that goes around the rear end. Flush five-spoke alloy wheels contribute to a low drag coefficient of just 0.24. The simplicity is taken to an even greater extreme on the inside, with a layered dashboard and a striking asymmetrical centre console. The usual displays have been resized for a unique driving experience, so the centre screen measures a massive 12.3 inches, while the instrument cluster has been reduced to a small floating screen. Touch controls replace most physical buttons, and a storage compartment with wireless smartphone charging resides within the double-layer armrest. Geely says that the Geometry A meets Europe’s OEKO-TEX Standard 100 environmental protection standard, making it safe even for newborn babies. The eco-friendly fabrics, which are waterproof, antifouling and breathable, are claimed to prevent the seats from rapidly diverging from the ambient temperature while also being soft to the touch and comfortable to sit on. Power comes from a permanent synchronous magnet motor that develops 120 kW (161 hp) and 250 Nm of torque, allowing the Geometry A to sprint from zero to 100 km/h in 8.8 seconds. It’s juiced by a ternary lithium battery that is available in two versions, 51.9 kWh and 61.9 kWh, with the former having a range of 410 km on the European NEDC cycle, and the latter delivering up to 500 km. 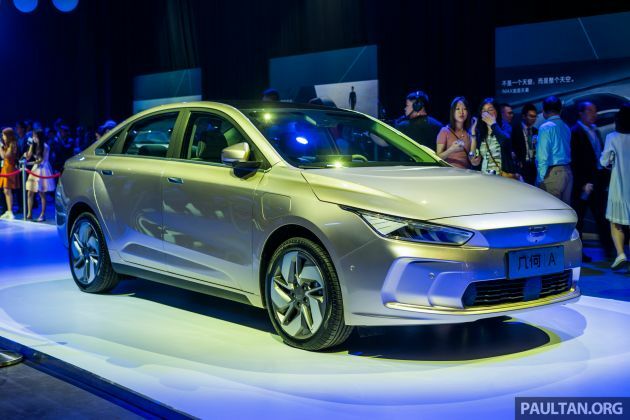 The Geometry A has a quoted energy consumption figure of 13.5 kWh per 100 km which, according to Geely, means that with current electricity prices in Beijing it will cost just 0.07 yuan (4.3 sen) to travel one kilometre. The car is equipped with a fast charging system that enables it to go from 30% to 80% charge in just 30 minutes, as well as a Super E Energy Station which can supply power to laptops and other equipment with an external power plug – Geely says this will allow users to camp outdoors with ease. In terms of safety, the car will come with a full suite of driver assists as standard, which Geely says achieves Level 2+ semi-autonomous driving. These include autonomous emergency braking with pedestrian detection, adaptive cruise control up to 150 km/h, lane keep assist, bind spot monitoring, door opening warning and a new rear collision warning that will flash the hazard lights if it senses an impending rear-end collision. The Geometry A will launch in China in three variants across the standard and long-range versions. The former starts at 210,000 yuan (RM128,800) for the base model, 220,000 yuan (RM134,900) for the midrange variant and 230,000 yuan (RM141,000) for the range-topper. The same variants for the long-range model are priced at 230,000 yuan, 240,000 yuan (RM147,200) and 250,000 yuan (RM153,300) respectively, while local subsidies will bring those prices down to between 150,000 yuan (RM92,000) and 190,000 yuan (RM116,500). Geely is offering several freebies for those who book before June 26, including lifetime Internet data, roadside assistance and even battery warranty, plus a free home charger (including installation) and cable, exclusive charging at the dealer, 24-instalment, zero-interest financing and 5,000 yuan (RM3,000) of trade-in credit. Also being thrown in is 5,000 yuan in cash and an A+ Options Package worth another 5,000 yuan. So much for Malaysia being the EV hub……..
People are avoiding PH Malaysia. Utter failure of 60year New Economic Policy (NEP) gone horribly wrong. Really gotta admit that. I admit. The problem with NEP was the old man which we brought back. Now regret bring him and his konco-konco back. Plague Hit Malaysia you mean. hehehe…. coz SG is small and easy implementation of EV. now charging station everywhere. same goes with other ev car. Malaysia aren’t suitable yet. Not because of political issues. If it were, Geely won’t ever indulge in any business transactions with Malaysia. Madani’s head should have rolled. Tok kok sing song oh we gonna be EEV hub, we this, we that, harga kereta turun (by comparing current top spec vs previous base spec) blablabla. Instead, Mercedes and others go open battery, hybrid tech assembly in Thailand, SG etc but here. Stupid as hell waste of money Marii. At Rm92k? Wow! Abesla all Japanese sedans! Nobody will want ancient Japanese cars with fossil fuel burning engine when they can get an EV car with 500km range. Now I see why Toyota was begging to partner with Geely for their EV tech. What was Toyota doing all this time? You can’t really use that 92k price to compare because that is the subsidised price. You have to compare with the unsubsidised price. China subsidy can be extended to export models if their Government approves. Nice, we will see china overtaking jap car when we moving into EV ..
Kecian. No one wants to come MY anymore since May 9. Previously we have been a hub for launches of unique cars to the region like the Mustang, Civic Type R, Renault Zoe & Twizzy, and many others. I wonder why everyone is keeping their distance away from PH ruled MY. All of those were parallel imported, not official launches. Next time mirror yourself before you go around calling people bodoh. It only makes you look like a fool. Clean government sapu’ed everything, no wonder we are getting poorer by the day. Congrats on cleaning out Malaysia’s wealth. Learn to work hard, john. Don’t always rely on government assistance in your life. It’s great to see major manufacturers putting resources into EV cars. However, unless there is concerted effort from the government, these cars will remain in the premium segment and sell in small numbers compared with ICE cars or even PHEVs. Success of the EV market is highly dependent on government subsidies. Unfortunately only countries with large financial reserves can afford this (I am surprised Argentina can do this). Coming from Geely themselves, I guess this EV Geometry (or future Proton Geometri / Trigonometri / 3-Segi / 3D / 1+3D if possible) is here to stay. It’s good to see a mega car company (why mega…? They keep eating up the rest and growing) other than Nissan / Kia / Hyundai / Toyota puts the foot down on EV with something that actually looks like a normal sedan (ahem i3 ahem…) and with lower price too. Do hope that this actually makes it to the masses to bring down the price of EV. Nissan has been trying to do that front eh beginning. malaysia is still a long way from wider EV adoption i believe.. partly because we are an oil producer and fuel is still relatively cheap here compared to other countries in the region. on top of that.. the majority of fossil fuel users are budget concious consumers. unless there is a super budget priced EV vehicle on sale, there will not be enough take-up by the masses, which also doesn’t justify a huge investment on infrastructure.